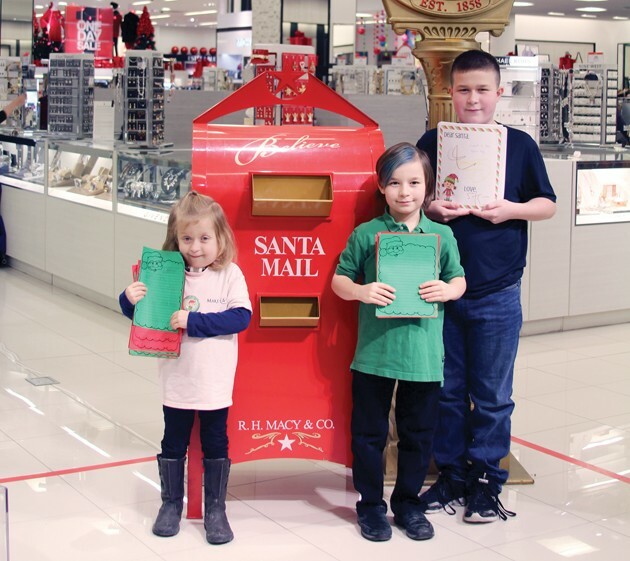 Maggie, Graeme and Leif Putnam delivered more than 450 letters to Santa Claus to a Macy’s department store to benefit the Make-A-Wish Foundation. Maggie, who has an inoperable tumor and a tracheostomy, has participated in Make-A-Wish for the past three years. Macy’s donates $1 to Make-A-Wish for each letter it receives, up to $1 million. The Putnam family, in conjunction with the Make-A-Wish Foundation, collected more than 450 letters to Santa Claus from West Elementary, the Early Learning Center and N-Step Dance Academy, as well as family and friends. They delivered them to Macy’s Department Store, which donates $1 per letter to Make-A-Wish to benefit families in need. Maggie Putnam, who has an inoperable tumor and a tracheostomy, has been a dancer at N-Step Dance Academy for the past five years. She has participated in Make-A-Wish for three years, and her wish is to visit the princesses in their castle. She and her brothers, Leif and Graeme Putnam, handed out candy donated by Walmart and special colored Santa letters donated by The UPS Store to their friends, family and fellow dancers. The Putnams gathered the letters and put them in the big red mailbox at Macy’s, which has donated to Make-A-Wish since 2003. The mission of the Make-A-Wish Foundation is to offer hope and special moments that will last a lifetime for the family, as well as the child who has a life-threatening medical condition.